Is your strobe safe to be used with your new digital camera? High voltage can damage a cameras electronic circuitry. The voltage reducing circuit built into the Paramount Voltage Protected Sync cord protects your camera. 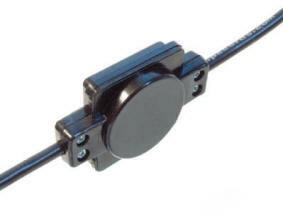 The voltage limiting circuit has been strategically placed close to the camera for optimum performance and reliability. The circuit lowers flash sync voltage to a safe 6 volts. High sync voltage is any voltage in excess of the 6 volts recommended by camera manufacturers. The voltage level determines the intensity of this spark. Sync voltages around 20 or 30 volts DC are not immediately dangerous; but can over time damage the camera’s X-sync contact. Many older non-dedicated flash units, especially studio strobes, have sync voltage in excess of 50 to 60 volts DC. This voltage level is excessive for almost every currently made camera and lens. Some flashes may even generate voltage in excess of 200 volts. For example, some Vivitar 283 ‘s flashes generate 280 volts DC which can quickly damage your camera’s sync contacts. It’s easy to test any flash for its trigger voltage level using a standard voltmeter. Digital voltmeters are relatively inexpensive and easy to find at stores like Home Depot, WalMart and other stores that carry hardware supplies. The plus (+) lead is attached to the positive contact in the PC sync cord, while the minus (-) lead is attached to the ground contact of the PC sync cord. With hot shoe flash units, the plus lead should be placed on the + contact in the middle of the hot shoe , while the minus lead should be grounded on the hot shoe’s ground terminal, usually located on the side above the lock nut. Usually the voltmeter or multimeter has several different settings for DC voltage depending on the range you’re trying to measure. With an unknown strobe, it’s best to start in the high range just in case or else the voltmeter’s fuse might blow! On top of some Vivitar 283, Vivitar 285 ‘s have voltages of 300 Volts and above! 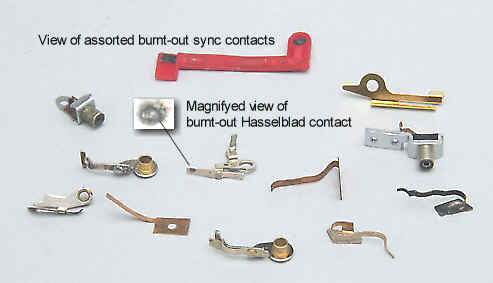 Below are examples of burnt-out sync contacts. How to order Voltage Protected Sync Cords? -Adding Voltage protection to an existing cord. We will add voltage protection to any Paramount Sync Cord for $55.00 plus $6.00 shipping. 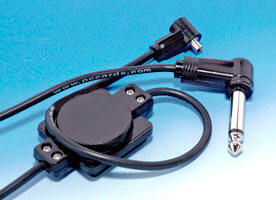 Send us any Paramount Sync Cord and we will add the “VP” circuit to an existing cord. Allow 2 weeks for delivery. -Adding Voltage protection to any Paramount Sync cord from our entire line of cords. The code ” VP ” in front of the catalog number will identify that cord as a voltage protected cord.